For years, my fellow guitarists have been asking me to compose a solo classical guitar piece that reflects that most American of musical styles—the blues. Their prodding was the motivation for Periwinkle Memories; the inspiration for the piece, however, really came from a maestro of extraordinary skill, and a teacher of even more extraordinary patience, Elias Barreiro, my guitar teacher at the University of New Orleans. I have always tried to emulate in my performances the beauty of his interpretations, and to fuse in my compositions the power and emotion of the blues. The name, Periwinkle Memories was a serendipity. I was struck by the light purplish-blue hue of the periwinkle, and soon learned the history of the funnel-shaped flower (Vinca minor.) Though it now grows wild in parts of the United States it is native to Australia, some consider it an invasive weed, most admire its extraordinary beauty. Common herbicides won’t kill it. The periwinkle is too vigorous and hardy for that. And now it is not merely a begrudged part of the American landscape, it is a vibrant part of the American landscape, elegant, stubborn, and nearly native. Like the blues. And like that young recalcitrant student Maestro Barreiro worked so hard to mold so many years ago. 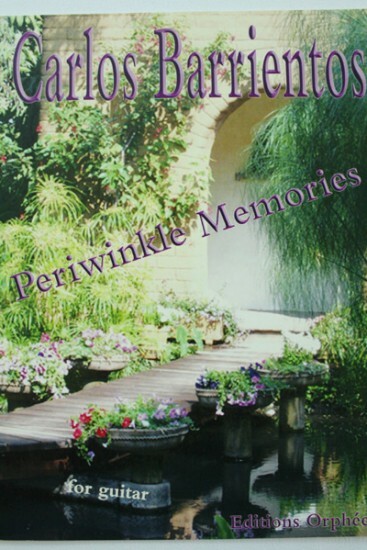 Ogden Nash said, “One man’s remorse is another man’s reminiscence.” Periwinkle Memories is a celebration of Maestro Barreiro, and of both facets of that adage in me.